HIPAA compliance is critical and can be overwhelming. We’re here to help. Our assessment process includes helpful definitions and explanations. Even if you aren’t intimately familiar with the Security and Privacy Rules, we can help you document your organization’s current standing, and make a plan for the next year. Medcurity® produces a final report that automatically identifies key priorities for your organization. The report includes recommendations on how to address open items. Show off your progress! HIPAA-covered entities must document that they addressing findings from their risk assessment. The action items identified in your annual report are automatically added to your online portal. You can assign ownership to team members, make notes, and track status and completion dates. Get a running start on next year’s assessment. Much like completing a tax return online, your information can be brought forward next year. Want to assign a section of questions to your IT manager? You can do that. Medcurity® allows multiple users to log in and work on an assessment. You can also move from your laptop, to your smartphone, which can be very helpful as you complete the physical assessment. If you had paused to work on other priorities for a few days, Medcurity® brings you right back to where you left off. 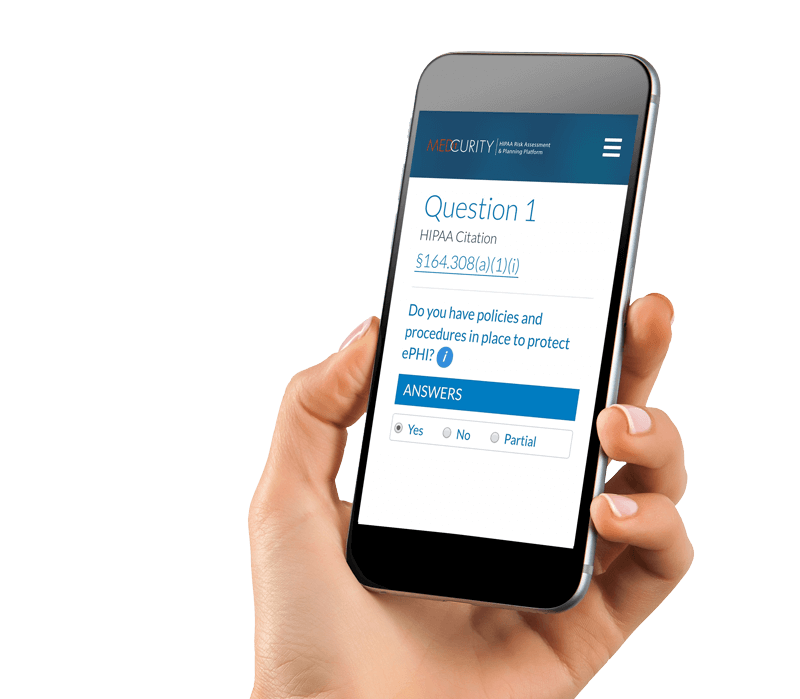 Complete your Annual HIPAA Risk Assessment with Medcurity®. A simple tool for a comprehensive assessment. We do everything a spreadsheet can’t: Guided questions, support for multiple devices, explanations and definitions, online task tracking, and a full report with recommendations. Administrative Safeguards focus on your organization’s policies, procedures, and security measures that protect Protected Health Information (PHI). The goal is to ensure patient data is correct and accessible to authorized parties. Physical Safeguards focus on the physical access to PHI. Physical Safeguards establish how devices that store PHI are protected to prevent physical theft and loss of devices. Technical Safeguards focus on protecting electronic PHI and controlling access to it. These contain technology-related measures to guard your networks and devices from data breaches and unauthorized access. The best way to find out if your employees are following your organization’s security policies is to watch employees in action. This is accomplished by conducting a walkthrough using a checklist that helps you compare security requirements with actual employee practices. We supply a model checklist for your use. Experience a HIPAA assessment tool that truly helps you along the way, and so much more.